Casino Royale is rereleased to Blu-ray and DVD just in time for the next installment in the franchise. On November 14 the latest James Bond film, Quantum of Solace, will make its way into theaters. 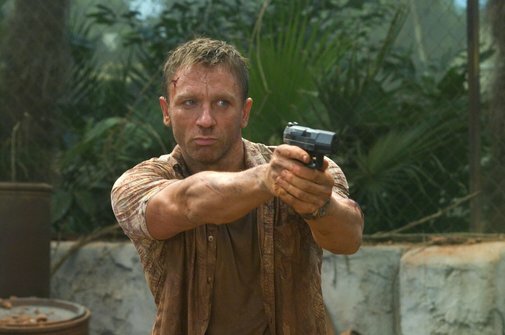 It features Daniel Craig as the licenced to kill double-O agent, Craig's second outing in the role. Craig first slipped on the tuxedo in 2006 for Casino Royale, a reboot for a franchise which needed no reboot (the box office take from Die Another Day, the last Brosnan Bond film was huge). Even so, despite being lambasted in the press, Craig's new Bond film received outstanding reviews. I may have even called it the best film of 2006. Casino Royale features Bond on his first assignment with a licence to kill (the pre-title sequence shows him receiving the licence), and is based on Ian Fleming's first Bond novel. Craig's Bond is n ot yet the suave, smooth, unflappable character that he becomes down the line. Craig's Bond is still rough around the edges and works more based off his heart than his head (closer to Timothy Dalton's representation than Roger Moore's). The basic plot features Bond out to stop Le Chiffre (Mads Mikkelsen), who is masterminding a nefarious terrorist scheme involving banks. On the way, Bond falls in love with the woman M (Judi Dench) sends to help him, Vesper Lynd (Eva Green). But, without ruining anything that happens, I think we all know that James Bond and love are two things that simply don't work together. This outing has just been released to Blu-ray and regular DVD in a special "Collector's Edition." As one has a right to expect from a Blu-ray release of a recent film, the picture and sound in this edition are truly outstanding, but, if you already own a prior release the question of whether this new one is worth it depends more on the new special features than the presentation itself. Exclusive to the Blu-ray edition is "Know Your Double-O". This is a trivia game with multiple skill levels and consists of, as one would assume from the name and the releas e it's a part of, quizzes people about their knowledge of Bond. While the questions do seem to skew towards Casino Royale, they are not exclusively centered on the film. Also exclusive to the Blu-ray edition is the ability to watch a picture-in-picture commentary track rather than simply hearing the commentary over the film. Watching the director, Martin Campbell, and producer, Michael G. Wilson, talk about the film as the film is running actually works very well. The picture-in-picture box of Wilson and Campbell is small enough so as to not detract from the film itself, and helps put a face to whom is speaking. Unfortunately however, their commentary picture box is not present throughout the film, it disappears and returns despite the fact that the dialogue never stops (it is entirely possible that Wilson and Campbell did multiple takes or sessions and that the final audio is cut together from those to work as a single whole while a jump cut in the video would be obvious). Both the DVD and Blu-Ray feature some never-before-seen deleted scenes and more behind-the-scenes documentaries than one can shake a stick at. There are looks at the links between Bond and the Bahamas (a location used in this and other Bond films), an examination of Ian Fleming, and an extended version of the 2002 AMC documentary Bond Girls are Forever. The DVD release contains all this material over the course of three discs, whereas the Blu-ray one manages to squeeze it onto two. It is a good release of one of the best Bond films to come our way in a long time, but it is hard to suggest to someone who might already have the film on Blu-ray (there was an earlier release) that they need to go out and purchase it due to some of the new bonus features. However, anyone who has upgraded from DVD to Blu-ray and doesn't have this film in the new format would do well to upgrade. Additionally, to try to entice people to buy the new set, both the DVD and Blu-ray releases come complete with "e-movie cash" in the amount of $10.50 which can be used to buy tickets to Quantum of Solace.